While we worked on a number of smaller projects last summer, our big one was an excavation at Orwell Corner Historic Village that spanned nearly two months, beginning in July and wrapping up at the end of August. If you’ve never been, Orwell Corner (part of the Prince Edward Island Museum and Heritage Foundation’s museum system) is a fantastic site that provides a glimpse into life in a late 19th c. agricultural community on PEI, complete with general store/Victorian-era home, blacksmith’s shop, and working barns, and an awesome interpretive center that focuses on the history of agriculture in the area. It’s a very popular site, and a must-visit if you get the chance. The site we worked on was located behind the interpretive center, and just outside the village. It was brought to our attention by the site director, who had been keeping his eye on it for some time. Consisting of a large depression obscured by vegetation, it certainly looked like a promising site, and although we had only planned to spend 1-2 weeks excavating, we quickly changed our minds when we began to dig in and realized that it was chock full of artefacts. We don’t have an exact number yet, but it’s definitely in the thousands. Aside from the wealth of artefacts uncovered, this site proved unique in two other respects. The first is that, for the first time, we’ve actually been able to conduct archival investigation into a site and its occupants, attaching names (no faces…yet) to it. It might seem a strange thing to say; however, the other sites we’ve worked on (Acadian and aboriginal) simply do not present this opportunity. We might know who the people were in a general sense, but with the site in Orwell, we were able to take things to a whole new level. Knowing the names of past inhabitants really helped to enhance the experience, and although we didn’t find any artefacts we can attribute with confidence to particular individuals, the artefacts we’ve found have taken on added significance because of it. The second thing that makes this site unique is its location. Not only is it situated in a historic village, but it is also extremely accessible to the public, being just off the road on the way into the village. 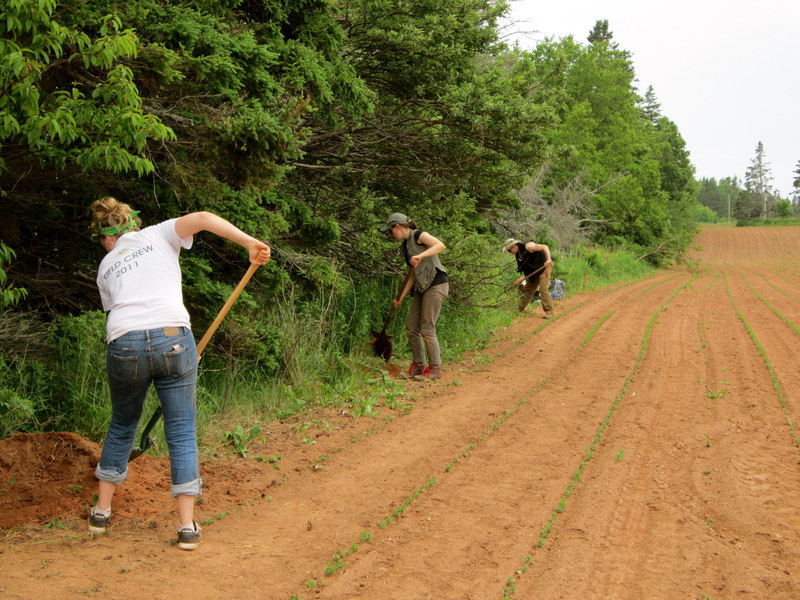 As a rule, the sites we’ve worked on have tended to be in the middle of nowhere (yes, even PEI has those places), and as a result, the public has been largely cut off from archaeology. But at Orwell, this barrier has been smashed to pieces. In the time that we were there, there was almost always a constant stream of visitors stopping by to see what we were up to. Many were content to watch us work and ask questions, but for those who wanted more, we managed to get a bit of a public archaeology program set up, albeit an ad hoc one. Still, it was a great opportunity for us to present our craft to the public, which ranged in age from young children to seniors, our oldest visitor being my then 95-year-old great-grandmother. 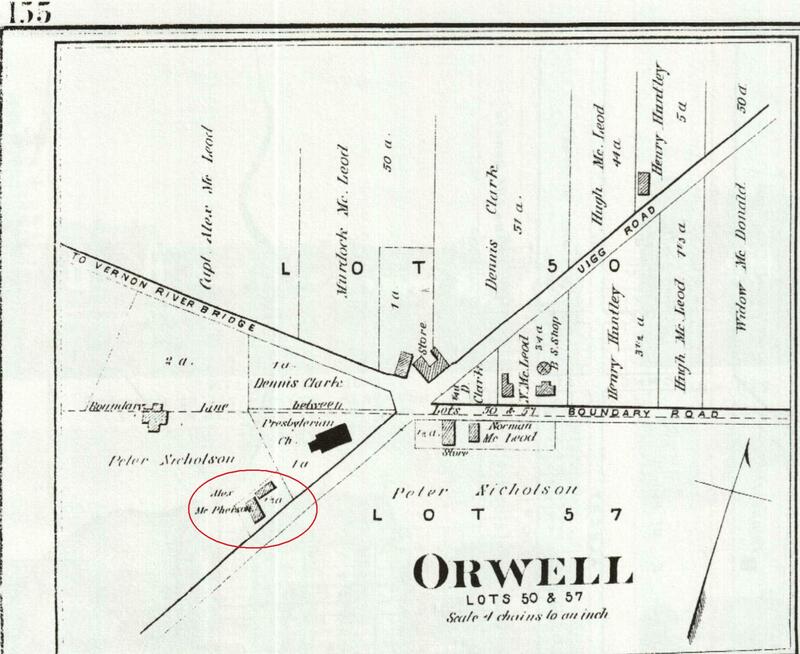 This week, we resumed excavations at Orwell for 2013, and have opened it up to the public again. We’ve already had people stop by to visit and try their hand at archaeology, so if you’re interested, be sure to check us out! Here are a number of pictures (field season 2012) to give you a sense of the site and the artefacts uncovered. Looking at the site from the road. Isaac and Meghan clearing the site of vegetation. Isaac and Dr. Kristmanson opening units for excavation. A white comb, just one of the many personal items uncovered during excavation. Dawne displays a nice ceramic sherd. Horses passing by the site. Note the interpretive center in the background. A shot of the area under excavation early on. Bottle and stoneware creamer found side by side. The stoneware creamer ended up coming out of the ground virtually intact. A nice example of Island-made pottery. A shot of wooden planks, possible floor boards which collapsed into the cellar. Our display table that we set up each day we were on site. Meghan speaks with visitors, while Linda excavates around the stove. A bottle of “snake oil” emerges. Looking at the site through the windows of the lab we were permitted to use inside the interpretive center. Diana at work with a pair of root clippers. Dr. Kristmanson shows off one half of a pair of scissors she uncovered. Meghan displays the oldest dateable artefact uncovered, a bottle dating from the late 1860s to early 1870s. A shot of the eyepiece, without doubt one of the most unexpected artefacts, and practically intact to boot. Linda shows off a large ceramic sherd. Our site mascot keeping an eye on things outside the interpretive center. Isaac supervising a group of children who stopped by to try their hand at archaeology. Dawne seems quite pleased with her find! Archaeology never fails to attract media attention. Diana holds up a ceramic sherd she uncovered. A shot of of the excavation showing the area covered. Note the stove visible at center-right. Dr. Kristmanson shows off a recently uncovered medicine bottle. Dr. Kristmanson precariously perched, getting final shots of the units prior to back-filling, while Isaac stands around with hands in pockets. 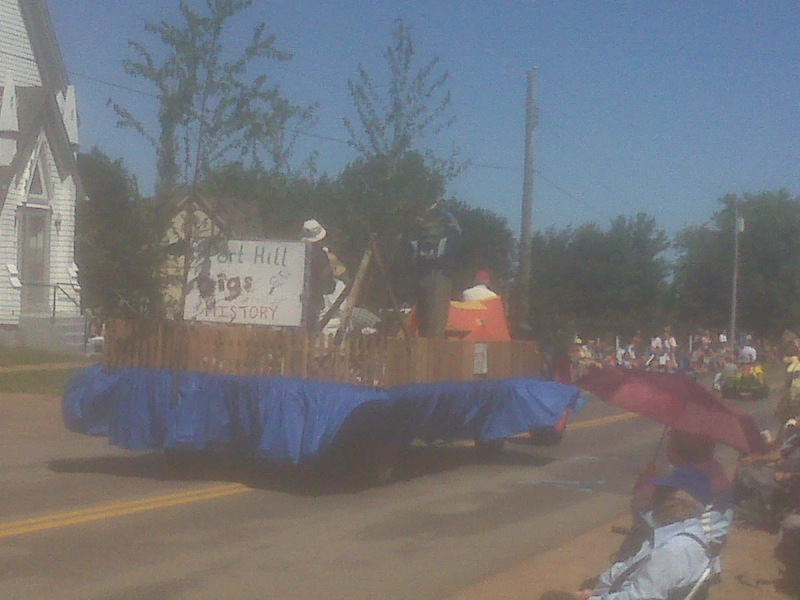 The Port Hill Women’s Institute float in the Tyne Valley parade was inspired by the dig at Pointe-Aux-Vieux! !